Sobonfu Somé is an internationally known author, teacher and activist — one of the foremost voices in African spirituality to come to the west. Sobonfu, whose name means “keeper of the rituals”, travels the world on a healing mission. sharing the rich spiritual life and culture of her native land Burkina Faso. Although ranked as one of the world’s poorest countries, Burkina Faso is one of the richest in spiritual life and customs. Sobonfu had a small website that needed expansion to accurately reflect her mission and the impact she is making on the world. The existing website, while not unattractive, was built by using one large image that didn’t allow editing of content on the home page, and was terrible for SEO. Poorly organized, the site needed updated and additional content, and a way for her to easily maintain everything. We provided a beautiful, elegant design of which Sobonfu can be proud. 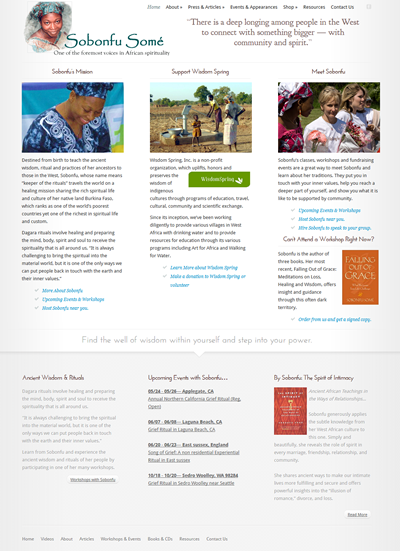 The site now focuses on bringing relevant information to those who wish to participate with Sobonfu’s work to share her traditions, and her work raising money through her non-profit to build wells and educate children. Taking a hard look at existing content, we came up with a plan to improve the site’s information architecture and easily identify what content was missing to give her a complete presence on the Web. Best of all, we built the new website using a popular Content Management System that gives Sobonfu the ability to update any and all content, announce her events, and provide an upgraded shopping experience for visitors seeking her books and materials. She is delighted with her new website.